I love wires. You might even say I dream of them. But it’s time to stop thinking of MIDI as being a wire. MIDI has always been transport independent; that is, it’s a protocol that can run over anything. Apple has been doing more than anyone lately to exploit that potential, building wireless MIDI capabilities into iOS and (with the upcoming Yosemite) OS X. Now, here’s where wireless starts to look appealing – when you go mobile. Bluetooth is now capable of more reliable, low-latency, easy-to-configure setup than before, which means you might want to wipe your brain of your previous impressions of what going wireless means. We’ll do a full test as this stuff comes out (I’ve just received a PUC, and need to do some proper performance testing). But here are some previews of some of the tricks this setup can pull off. And they all work today – well, in some form, though not always on released software. 1. 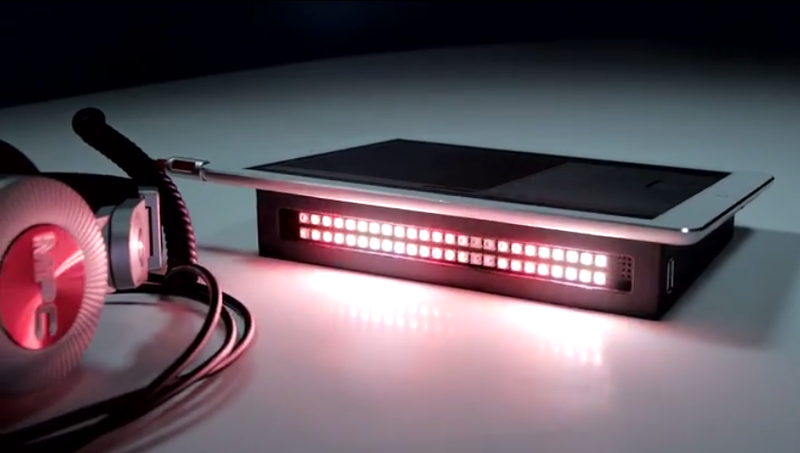 It powers and connects wired USB MIDI devices – acting as a hub for controllers, connecting them to iOS (or OS X) over Bluetooth MIDI. 2. It connects to external audio. 3. It acts as a sticky stand, propping up your iPad and keeping it from slipping. And MIDI and USB, disco lights aside, are quite functional. You can reprogram MIDI functions, for making your own arpeggiators, filters, and the like. The USB ports are proper USB host ports, so they work not only with USB MIDI devices but gadgets like joysticks and keyboards, too. It’s US$99 on preorder, assuming they get enough preorders, via the talented iOS developer Retronyms. Clarification: I’m surprised that describing this with the words “it could be appealing” (emphasis mine), even with the caveat that I wouldn’t want to record or perform with it is something causing some angry reactions. Let me be clear: there are some ups and downs to this design solution. The USB hub function is nice, but then you have hardware with somewhat crossed purposes. You rely on wireless to the iPad, but you don’t get wireless on the other hardware – when you’re really prefer everything be wireless or for wired hardware to work with the iPad. Second, the wedge design adds a lot of bulk to a mobile device – all for the purpose of adding a light-up display you probably don’t need. For now, I think a MIDI hub remains a better solution. In fact, the real flaw here is that Apple’s port can’t accept both power and connections. This is a fascinating workaround, but it’s a workaround. If we just had a USB connection that also took power, I think this would be solved – that “rat’s nest’ of cables is still required anyway, until MIDI hardware goes wireless. But I don’t see any harm in trying an idea, least of all when would-be preorder customers effectively vote with their dollars about whether it should be made. And if people don’t mind having this wedge on their desk, it’s not so bad – and a convenient way to try things out quickly on the iPad if it does spend a lot of time on your desk (without having to sacrifice its power port). I can see why it was made by app developers; some iPad enthusiasts might indeed want this. Stay tuned for our test. Wireless MIDI isn’t limited to all this new-fangled hardware. The most convenient application won’t require any hardware at all. 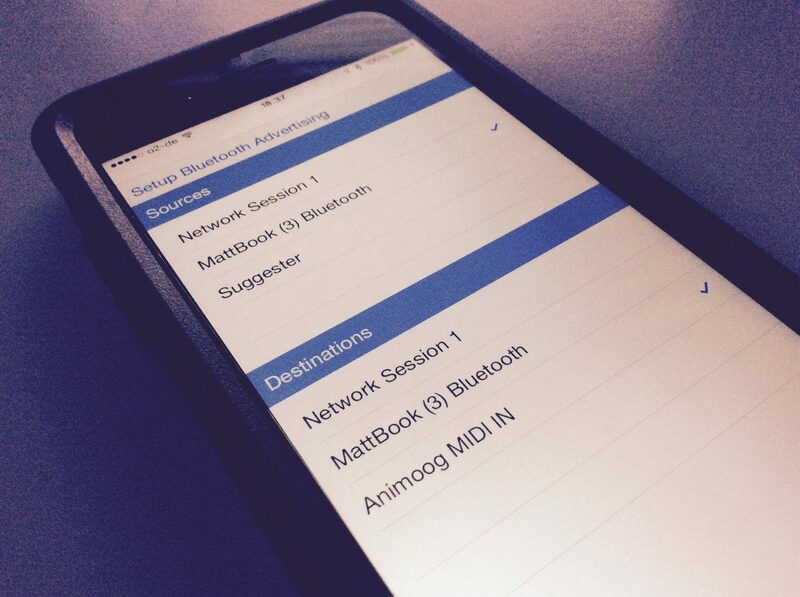 You can now route MIDI wirelessly between an iOS mobile device and OS X Yosemite. From mobile to desktop, that means multi-touch controllers, X/Y pads, alternative keyboards, step sequencers, DAW controllers, and the like can all become quick-and-dirty controllers for your computer. That seems like it’ll be ideal for quick control of a computer on the go — sitting on a bus, for instance, you could whip out an iPad mini and play without having to remember cables and controllers. Going the opposite direction, you’ll have an option for sequencing and syncing your mobile gadget from your desktop. Yosemite isn’t out yet, so developers aren’t necessarily shipping this yet, but early reports from devs have been extremely positive – see the image from Matt Smada, below. (Thanks to Matt and Gwydion for the reports.) Developers have been enthusiastic about both performance and ease of development. And that’s good news – this doesn’t have to be a replacement for wires; if it’s easy to do, it can be complementary. There’s no reason your creativity has to die just because you don’t have the right cable or adapter. Matt’s app can even connect to other apps that haven’t yet added support for the feature. “Think of it as a route-everything-everywhere app,” he says, in a quick-and-dirty Facebook post on his proof of concept. For more on the feature, you can watch the sessions from WWDC (if you’re a developer). For everyone else, expect more on this soon – particularly as we test real-world performance and reliability.